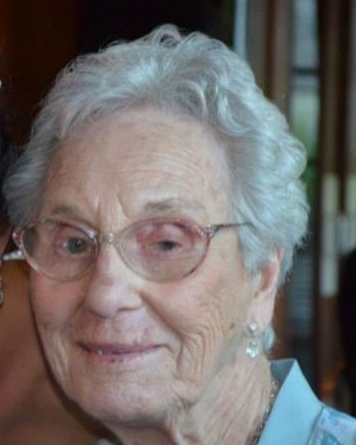 Angeline M. “Angie” (Algiere) Allen, 97, of John St. Westerly, RI died peacefully on Tuesday April 9, 2019 at the Royal Westerly Nursing Home. She was the beloved wife of the late Ernest Allen. Born in Westerly, RI on March 5, 1922 she was the daughter of the late Angelo and Georgette (Gabriel) Algiere. Mrs. Allen had been employed at the George C. Moore Company in Westerly for many years before retiring. She was an active communicant of St. Pius X. Church in Westerly. Angie enjoyed spending time with her family, making Sunday dinners and designing and making wedding cakes. She loved watching sports; especially the UCONN girls basketball, the New England Patriots and Red Sox. Angie will be sadly missed by her three sons; Ronald Allen and his wife Virginia of Pawcatuck, CT, Donald Allen and his wife Dale of Westerly and Steven Allen of Westerly. She also leaves behind two sisters, Clarice Greene of Colorado and Carmella Getty of Westerly, RI, 9 grandchildren, 11 great-grandchildren, and 1 great-great-granddaughter. She was predeceased by her brothers and sisters, Santo Algiere, Natale Algiere, Joseph Algiere, Frank Algiere, Charles Algiere, Rose Pucci, Jeannette DePerry, Aquilena M. “Ackie” Sposasto and Frances Eusebio, and Louise Lewis, as well as her daughter-in-law Cheryl Allen. The Allen Family would like to express their sincere thanks to the Royal Westerly Nursing Home for love and care shown to them and their mother during her illness. A Mass of Christian Burial will be held on Saturday April 13, 2019 at 11:00 AM at St. Pius X. Church, 44 Elm St., Westerly, RI. Burial will follow in St. Michael’s Cemetery Pawcatuck, CT. Calling hours will be Friday evening from 4-7 PM at the Buckler-Johnston Funeral Home, 121 Main St. Westerly, RI. In lieu of flowers donations may be made to the St. Michael Capital Campaign, 60 Liberty St. Pawcatuck, CT. 06379.